Stop what you’re doing right now. I’m not joking. Stop what you’re doing and make this fried chicken. You won’t regret it. You won’t remember what you were about to do that was so important. You will be too absorbed in how amazing this chicken is. Here, wait, I’ll buy you some time. All you have to do right this minute is make the marinade (it takes seconds), put the chicken in, and stick it in the fridge for two days. You can let it marinade for less time, but I wouldn’t skimp. The result is the moistest, most flavorful chicken – let alone fried chicken – you’ve ever had. This recipe comes from The Clinton St. Baking Company Cookbook, which has quickly become one of my all time favorite resources. Although this small Lower East Side spot is best known for its breakfast, their fried chicken is insane. And this recipe reproduces it perfectly. It’s fool proof. Even if you’ve never fried chicken before, never fear, this recipe will lead the way. While the marinade gives the meat its flavor, the simple flour and cornmeal coating creates a perfectly crisp exterior. Just be sure your oil is hot before you start frying. We ate this for dinner. Then, we had it cold for lunch the next day. Finally, we cut the last scraps off the bone and enjoyed it in an almost healthy fried chicken salad. Since you’re the cook, you can use your favorite chicken pieces. While the most economical way is to cut up a whole chicken, I opted for just my favorites: drumsticks and breast. I served it with health salad and a quick warm potato salad (simply boiled new potatoes tossed them with mustard, olive oil, lemon juice, and parsley). Clinton St.’s buttermilk biscuits would also make an excellent side (and are a great use for any leftover buttermilk). Adapted from The Clinton St. Baking Company Cookbook. Whisk together the marinade ingredients in a large bowl. Add the chicken pieces and coat well. Store in an air tight container in the fridge for at least 3 hours or up to two days. Whisk together the coating ingredients in a large bowl. Remove the chicken pieces from the marinade (do not drain off excess marinade) and dredge in the coating one piece at a time. Coat well, covering all the nooks and crannies. Set aside on a plate. Reserve extra coating. Fill a large heavy-bottomed pan about halfway with canola oil (may be more or less than 6 cups). Heat the oil to 350F over medium heat, which will probably take 8 to 10 minutes. Be patient. You want this nice and hot. With tongs, carefully place the chicken skin-side down in the oil and fry the chicken in batches so they don't crowd the pan. Fry each piece for 7 to 8 minutes per side (wings will take less time). Once cooked on both sides the chicken will be dark brown and crispy. Be careful when removing the chicken from the oil. It will be very hot. Drain the chicken on a paper-towel-lined sheet pan. After your first batch, the temperature of the oil will dip so bring the temperature back up to 350F before adding the second batch. If the chicken has absorbed the coating before being fried dip it back in the coating before frying. Fry the remaining pieces. Allow the chicken to rest at least three minutes before serving. Bookmarked!!! Oh yes, I agree. This looks like a recipe we all have to try! I have a cornmeal which I never use and it made me happy this is the chance to use! All I need is buttermilk and chicken. Can’t wait to try, seriously!!! I so hope you and your family enjoys Nami! Please let me know how it turns out if you do! Ooh I’m so excited! I can’t wait to hear how it turns out!! This looks like a pretty good recipe. My go-to recipe is more of a dry rub so it doesn’t need the marinade (and I’m heavy on black pepper) but I can see the advantages of what you’re doing. Definitely give it a try. Thanks. Ooh I’d love to try your recipe too (rarely do I meet fried chicken I don’t like). I’d love to hear your thoughts on the dry rub versus the marinade if you do give this a shot! The marinade really locks in the flavor and keeps the bird so so juicy. YUM yum yum… I am going to make this asap. And I’m going to look into that cookbook! Oh I hope you enjoy it! Definitely check out the cookbook – I love every recipe I’ve made from it! My mom made a buttermilk fried chicken that was out of this world- this is making my mouth water! So sorry for the delayed response, Kita but thank you so much for stopping by! Homemade fried chicken is definitely soooo much better than take out! Gosh, this is something I would love to have. Sounds fantastic and the crust looks absolutely a killer! Yummmmm…. Thanks for stopping by Kristy! 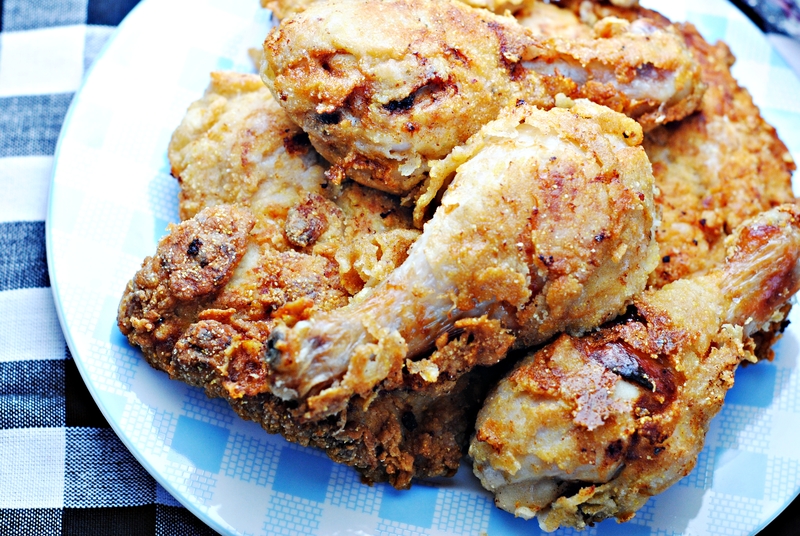 I would definitely recommend making this fried chicken if you have the chance, it is gooood! Thanks for stopping by my blog and commenting on my Boneless Buffalo Wings. By the way, this chicken looks amazing. Thanks for sharing! I know it’s different, but could i put the marinated chicken in the oven instead of frying it? would it still taste awesome? Hi Anna, great question! I think that would work well. I haven’t tried, but I would bake it in a hot (400 or 425F) oven on a wire rack. It should still get crispy. Let me know how it turns out! It’s definitely healthier than frying! Great fried chicken!-it was a big hit for dinner for 8 at the farm the other night, although I was scrambling to keep up with 2 pans going! I dialed the heat down because they were getting brown too quickly.I marinated for 8 hours, but next time I’ll try over night. It was seriously good chicken! So glad you enjoyed it! It’s one of my favorites. Definitely hard to keep up with demand – I like to get a head start and keep some warm in the oven, then serve it all at once. But of course nothing beats fried chicken straight out of the pan. Thanks for the feedback! Will definitely try this!! Looks awesome! Sorry for the delayed response – I meant black but I think either would work. Enjoy! !